In 1955 the mideastern balance of power shifted worrisomely in the Arab air forces' favor. In September of that year, Czechoslovakia supplied the Arabs with hundreds of different types of MiGs, including Ilyushin bombers. Egyptian jets outnumbered Israel's by a margin of 4:1 (Israel had 50, Egypt - about 200). Another problem was the qualitative gap. 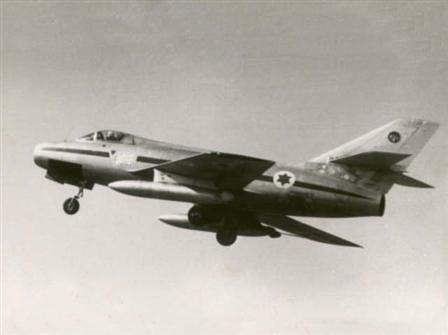 Israel's Meteors and Ouragans were significantly inferior to the MiG-15s - and even more so to the MiG-17's. Israel therefore pressed the French to supply it with new jet fighters. France offered to sell Israel Mystere 2 planes, but a delegation headed by Benny Peled submitted negative reports on the Mystere 2. The IAF's Commander-in-Chief, Dan Tolkovsky, decided against the Mystere 2's, and insisted on getting France's most advanced fighters at the time - the Mystere IVA. But there were many obstacles in the way: the Armee de l'Air did not feel very happy about giving Israel planes that were intended for itself, and the Quai d'Orsay objected to the deal because it would hurt French interests in the Arab world. The change in France's position occurred when the French elections brought a socialist government headed by Guy Mollet into office. France wanted an Israel that was stronger militarily, in order to hurt Egypt, which was cooperating with the Algerian Liberation Front and aimed at complete control over the Suez Canal. In March of 1956 the French agreed to sign the Mystere deal, supplying Israel with 12 Mystere IVA's - a relatively small number, which the Armee de l'Air could afford to give up. That same month, a group of pilots headed by Benny Peled set out to France. They were trained for solo flight in Cambrai Air Base in northern France, and were taught the necessary mechanical and maintenance skills as well. The pilots even executed a few supersonic 'booms' in Europe. Benny Peled and the other pilots were very impressed by the new plane's performance. It was the first time that they got to fly at the high speeds that they could only dream about in the past, and the first time they experienced a high G force, twice as powerful as any they had previously known. Another wonderful innovation were the G-suits, suits that had valves which compressed air over the stomach and legs, to block excess blood flow at high G. After training in formation flights, trial flights and range flights, the mission of bringing the Mysteres to Israel was undertaken. Benny Peled had the most experience flying the Mysteres and IAF Commander in Chief, Dan Tolkovsky, said he would endorse any plan that was decided upon in France. Peled suggested flying the planes to Israel from Mont de Marsan, through Brindisi in southern Italy. There, he suggested, detachable 620 liter fuel tanks would be connected to the wings, so that the planes could fly directly to Israel without stopping en route. On April 11th 1956, the first twelve Mysteres left for Israel. The flight lasted an hour and a half (the Israelis had 'taken over' the control tower, and communication was in Hebrew). The Mysteres landed at Hatzor, accompanied by a Nord. On April 23rd an additional deal was signed for the supply of 12 more planes, that were brought into Israel in operation 'Siyur'. 36 more airplanes were flown over in Operation 'Shaharit', the largest operation of its kind at the time. The operation was carried out in August 1956, in top secrecy. All in all, the IAF purchased 61 Mysteres. In September of 1956 there were only 12 combat-ready Mysteres in the First Combat Squadron, and at the outset of the Sinai ('Kadesh') Campaign, on October 29th 1956, just 16 of the Mystere IVA's were operational. They were armed with two 30 mm. cannon and could carry 68 mm. rockets, but were not yet equipped to carry bombs. There was only a handful of pilots who could fly the Mysteres, and even they had very little experience with the planes. On the first day of fighting, a single Mystere was sent on a visual reconnaissance mission over the Mitle region, some 30 minutes before Refael ('Raful') Eytan's paratroop battalion was to be dropped there. In the course of the airdrop, 12 Mysteres were sent to patrol over Egyptian airfields in the Suez Canal region, and prevent enemy planes from taking off to attack the planes carrying the paratroopers. However, the Egyptians had been taken by complete surprise, and none of their planes attempted to take off. On October 30th, the Mysteres flew top cover for a paratroop force in the Mitle Pass, which had come under attack from Egyptian planes. A dogfight evolved between the 6 Mysteres and about 20 MiG's, in which one MiG was shot down and others badly damaged. One of the Mysteres returned to base with a damage wing, and the rest were unharmed. The following day - October 31st - two of the Mysteres encountered four Egyptian Vampires and shot them down in a short air battle over the Mitle. On November 2nd, two groups of 4 Mysteres each were sent to attack Ras Natzrani and Sharm a-Sheikh in southern Sinai. At Ras Natzrani they met heavy antiaircraft fire, and in the third run Benny Peled's plane was hit and he had to eject. He was later rescued by a Piper Super Cub, whose pilot - Second Lt. Greenbaum - received a Citation of Merit for this action. On November 3rd, Mysteres in two groups of four were sent on a support mission near Sharm a-Sheikh. The planes attacked and sank a small Egyptian ship, and also mistakenly rocketed a British warship, HMS 'Crane'. The overall kill stats for the squadron in the Sinai Campaign were 7 enemy planes shot down, and one Mystere shot down by AA fire. Two squadrons of Mystere IVA's were used in the Six Day War, and they played a prominent part in attacks on all fronts, from raids on Egyptian bases in the Sinai to missions in the Syrian theater of operations. In the course of the fighting, the Mysteres shot down a Syrian MiG and a Jordanian Hunter. 8 Israeli Mysteres were shot down by antiaircraft guns. Following the Six Day War the Mysteres were retired from combat duty and assigned to advanced training. In February of 1971 they were permanently retired.